Federal Reserve Released Its Non-cash Payments Fraud Report. Have Chip Cards Helped? "... fraud totals and rates for payments processed over general-purpose credit and debit card networks, including non-prepaid and prepaid debit card networks, the automated clearinghouse (ACH) transfer system, and the check clearing system. These payment systems form the core of the noncash payment and settlement systems used to clear and settle everyday payments made by consumers and businesses in the United States. The fraud data were collected as part of Federal Reserve surveys of depository institutions in 2012 and 2015 and payment card networks in 2015 and 2016. The types of fraudulent payments covered in the study are those made by an unauthorized third party." "... the rate of card fraud, by value, was nearly flat from 2015 to 2016, with the rate of in-person card fraud decreasing notably and the rate of remote card fraud increasing significantly..."
Other. Fraud including fraud from account take-over and any other types of fraud not covered above." The increase in fraudulent application suggests that criminals consider it easy to intercept pre-screened credit and card offers sent via postal mail. It is easy for consumers to opt out of pre-screened credit and card offers. There is also the National Do Not Call Registry. Do both today if you haven't. "Card systems brought EMV processing online, and a liability shift, beginning in October 2015, created an incentive for merchants to accept chip cards. By value, the share of non-fraudulent in-person payments made with [chip cards] shifted dramatically between 2015 and 2016, with chip-authenticated payments increasing from 3.2 percent to 26.4 percent. The share of fraudulent in-person payments made with [chip cards] also increased from 4.1 percent in 2015 to 22.8 percent in 2016. As [chip cards] are more secure, this growth in the share of fraudulent in-person chip payments may seem counter-intuitive; however, it reflects the overall increase in use. Note that in 2015, the share of fraudulent in-person payments with [chip cards] (4.1 percent) was greater than the share of non-fraudulent in-person payments with [chip cards] (3.2 percent), a relationship that reversed in 2016." "In separate complaints, the FTC alleges that IDmission, LLC, mResource LLC (doing business as Loop Works, LLC), SmartStart Employment Screening, Inc., and VenPath, Inc. falsely claimed to be certified under the EU-U.S. Privacy Shield, which establishes a process to allow companies to transfer consumer data from European Union countries to the United States in compliance with EU law... The Department of Commerce administers the Privacy Shield framework, while the FTC enforces the promises companies make when joining the framework." According to the lawsuits, IDmission, a cloud-based services firm, applied in 2017 for Privacy Shield certification with the U.S. Department of Commerce but never completed the necessary steps to be certified under the program. The other three companies each obtained Privacy Shield certification in 2016 but allowed their certifications to lapse. VenPath is a data analytics firm. SmartStart offers employment and background screening services. mResource provides talent management and recruitment services. "... VenPath and SmartStart must also continue to apply the Privacy Shield protections to personal information they collected while participating in the program, protect it by another means authorized by the Privacy Shield framework, or return or delete the information within 10 days of the order." In the end, the decision seemed inevitable. After a seven-day trial in Kansas City federal court in March, in which Kansas Secretary of State Kris Kobach needed to be tutored on basic trial procedure by the judge and was found in contempt for his “willful failure” to obey a ruling, even he knew his chances were slim. Kobach told The Kansas City Star at the time that he expected the judge would rule against him (though he expressed optimism in his chances on appeal). Sure enough, federal Judge Julie Robinson overturned the law that Kobach was defending as lead counsel for the state, dealing him an unalloyed defeat. The statute, championed by Kobach and signed into law in 2013, required Kansans to present proof of citizenship in order to register to vote. The American Civil Liberties Union sued, contending that the law violated the National Voter Registration Act (AKA the “motor voter” law), which was designed to make it easy to register. That’s precisely what occurred and according to Robinson, an appointee of George W. Bush, the proof that voter fraud is widespread was utterly lacking. As the judge put it, “the court finds no credible evidence that a substantial number of non-citizens registered to vote” even under the previous law, which Kobach had claimed was weak. For Kobach, the trial should’ve been a moment of glory. He’s been arguing for a decade that voter fraud is a national calamity. Much of his career has been built on this issue, along with his fervent opposition to illegal immigration. (His claim is that unlawful immigrants are precisely the ones voting illegally.) Kobach, who also co-chaired the Trump administration’s short-lived commission on voter fraud, is perhaps the individual most identified with the cause of sniffing out and eradicating phony voter registration. He’s got a gilded resume, with degrees from Harvard University, Yale Law School and the University of Oxford, and is seen as both the intellect behind the cause and its prime advocate. Kobach has written voter laws in other jurisdictions and defended them in court. If anybody ever had time to marshal facts and arguments before a trial, it was Kobach. But things didn’t go well for him in the Kansas City courtroom, as Robinson’s opinion made clear. Kobach’s strongest evidence of non-citizen registration was anemic at best: Over a 20-year period, fewer than 40 non-citizens had attempted to register in one Kansas county that had 130,000 voters. Most of those 40 improper registrations were the result of mistakes or confusion rather than intentional attempts to mislead, and only five of the 40 managed to cast a vote. One of Kobach’s own experts even rebutted arguments made by both Kobach and President Donald Trump. The expert testified that a handful of improper registrations could not be extrapolated to conclude that 2.8 million fraudulent votes — roughly, the gap between Hillary Clinton and Trump in the popular vote tally — had been cast in the 2016 presidential election. Testimony from a second key expert for Kobach also fizzled. By the time the trial was over, Kobach, a charismatic 52-year-old whose broad shoulders and imposing height make him resemble an aging quarterback, seemed to have shrunk inside his chair at the defense table. But despite his defeat, Kobach’s causes — restricting immigration and tightening voting requirements — seem to be enjoying favorable tides elsewhere. Recent press accounts noted Kobach’s role in restoring a question about citizenship, abandoned since 1950, to U.S. Census forms for 2020. And the Supreme Court ruled on June 11 that the state of Ohio can purge voters from its rolls when they fail to vote even a single time and don’t return a mailing verifying their address, a provision that means more voters will need to re-register and prove their eligibility again. For his own part, Kobach is now a candidate for governor of Kansas, running neck and neck with the incumbent in polls for the Republican primary on Aug. 7. It’s not clear whether the verdict will affect his chances — or whether it will lead him and others to quietly retreat from claims of voter fraud. But the judge’s opinion and expert interviews reveal that Kobach effectively put the concept of mass voter fraud to the test — and the evidence crumbled. Perhaps it was an omen. Before Kobach could enter the courtroom inside the Robert J. Dole U.S. Courthouse each day, he had to pass through a hallway whose walls featured a celebratory display entitled “Americans by Choice: The Story of Immigration and Citizenship in Kansas.” Photographs of people who’d been sworn in as citizens in that very courthouse were superimposed on the translucent window shades. Public interest in the trial was high. The seating area quickly filled to capacity on the first day of trial on the frigid morning of March 6. The jury box was opened to spectators; it wouldn’t be needed, as this was a bench trial. Those who couldn’t squeeze in were sent to a lower floor, where a live feed had been prepared in a spillover room. Matters didn’t improve for Kobach from there. Becker often seemed nervous. She took her bright red glasses off and on. At times she burst into nervous chuckles after a misstep. She laughed at witnesses, skirmished with the judge and even taunted the lawyers for the ACLU. “I can’t wait to ask my questions on Monday!” she shouted at the end of the first week, jabbing a finger in the direction of Dale Ho, the lead attorney for the plaintiffs. Ho rolled his eyes. Kobach seemed unruffled. Instead of heeding her advice, he’d proffer the evidence for the record, a practice that allows the evidence to be preserved for appeal even if the trial judge refuses to admit it. Over the course of the trial, Kobach and his team would do this nearly a dozen times. Eventually, Robinson got fed up. She asked Kobach to justify his use of proffers. Kobach, seemingly alarmed, grabbed a copy of the Federal Rules of Civil Procedure — to which he had attached a growing number of Post-it notes — and quickly flipped through it, trying to find the relevant rule. The judge tried to help. “It’s Rule 26, of course, that’s been the basis for my rulings,” she told Kobach. “I think it would be helpful if you would just articulate under what provision of Rule 26 you think this is permissible.” Kobach seemed to play for time, asking clarifying questions rather than articulating a rationale. Finally, the judge offered mercy: a 15-minute break. Kobach’s team rushed from the courtroom. It wasn’t enough to save him. In her opinion, Robinson described “a pattern and practice by Defendant [Kobach] of flaunting disclosure and discovery rules.” As she put it, “it is not clear to the Court whether Defendant repeatedly failed to meet his disclosure obligations intentionally or due to his unfamiliarity with the federal rules.” She ordered Kobach to attend the equivalent of after-school tutoring: six hours of extra legal education on the rules of civil procedure or the rules of evidence (and to present the court with a certificate of completion). It’s always a bad idea for a lawyer to try the patience of a judge — and that’s doubly true during a bench trial, when the judge will decide not only the law, but also the facts. Kobach repeatedly annoyed Robinson with his procedural mistakes. But that was nothing next to what the judge viewed as Kobach’s intentional bad faith. This view emerged in writing right after the trial — that’s when Robinson issued her ruling finding Kobach in contempt — but before the verdict. And the conduct that inspired the contempt finding had persisted over several years. Robinson concluded that Kobach had intentionally failed to follow a ruling she issued in 2016 that ordered him to restore the privileges of 17,000 suspended Kansas voters. In her contempt ruling, the judge cited Kobach’s “history of noncompliance” with the order and characterized his explanations for not abiding by it as “nonsensical” and “disingenuous.” She wrote that she was “troubled” by Kobach’s “failure to take responsibility for violating this Court’s orders, and for failing to ensure compliance over an issue that he explicitly represented to the Court had been accomplished.” Robinson ordered Kobach to pay the ACLU’s legal fees for the contempt proceeding. That contempt ruling was actually the second time Kobach was singled out for punishment in the case. Before the trial, a federal magistrate judge deputized to oversee the discovery portion of the suit fined him $1,000 for making “patently misleading representations” about a voting fraud document Kobach had prepared for Trump. Kobach paid the fine with a state credit card. More than any procedural bumbling, the collapse of Kobach’s case traced back to the disintegration of a single witness. The witness was Jesse Richman, a political scientist from Old Dominion University, who has written studies on voter fraud. For this trial, Richman was paid $5,000 by the taxpayers of Kansas to measure non-citizen registration in the state. Richman was the man who had to deliver the goods for Kobach. With his gray-flecked beard and mustache, Richman looked the part of an academic, albeit one who seemed a bit too tall for his suit and who showed his discomfort in a series of awkward, sudden movements on the witness stand. At moments, Richman’s testimony turned combative, devolving into something resembling an episode of The Jerry Springer Show. By the time he left the stand, Richman had testified for more than five punishing hours. He’d bickered with the ACLU’s lawyer, raised his voice as he defended his studies and repeatedly sparred with the judge. Richman’s 2014 study of non-citizen registration used data from the Cooperative Congressional Election Study — an online survey of more than 32,000 people. Of those, fewer than 40 individuals indicated they were non-citizens registered to vote. Based on that sample, Richman concluded that up to 2.8 million illegal votes had been cast in 2008 by non-citizens. In fact, he put the illegal votes at somewhere between 38,000 and 2.8 million — a preposterously large range — and then Trump and others simply used the highest figure. Academics pilloried Richman’s conclusions. Two hundred political scientists signed an open letter criticizing the study, saying it should “not be cited or used in any debate over fraudulent voting.” Harvard’s Stephen Ansolabehere, who administered the CCES, published his own peer-reviewed paper lambasting Richman’s work. Indeed, by the time Trump read Richman’s article onstage in 2016, The Washington Post had already appended a note to the op-ed linking to three rebuttals and a peer-reviewed study debunking the research. None of that discouraged Kobach or Trump from repeating Richman’s conclusions. They then went a few steps further. They took the top end of the range for the 2008 election, assumed that it applied to the 2016 election, too, and further assumed that all of the fraudulent ballots had been cast for Clinton. On the courtroom’s televisions, Kobach appeared, saying Trump’s tweet was “absolutely correct.” Without naming Richman, Kobach referred to his study: The number of non-citizens who said they’d voted in 2008 was far larger than the popular vote margin, Kobach said on the video. The same number likely voted again in 2016. To estimate the number of non-citizens voting in Kansas, Richman had used the same methodology he employed in his much-criticized 2014 study. Using samples as small as a single voter, he’d produced surveys with wildly different estimates of non-citizen registration in the state. The multiple iterations confused everyone in the courtroom. “I sense the frustration,” Richman responded, before offering a winding explanation of the multiple data sources and surveys he’d used to arrive at a half-dozen different estimates. Robinson cut him off. “Maybe we need to stop here,” she said. “Your honor, let me finish answering your question,” he said. To refute Richman’s numbers, the ACLU called on Harvard’s Ansolabehere, whose data Richman had relied on in the past. Ansolabehere testified that Richman’s sample sizes were so small that it was just as possible that there were no non-citizens registered to vote in Kansas as 18,000. “There’s just a great deal of uncertainty with these estimates,” he said. The judge was harsher than Ansolabehere in her description of Richman’s testimony. In her opinion, Robinson unloaded a fusillade of dismissive adjectives, calling Richman’s conclusions “confusing, inconsistent and methodologically flawed,” and adding that they were “credibly dismantled” by Ansolabehere. She labeled elements of Richman’s testimony “disingenuous” and “misleading,” and stated that she gave his research “no weight” in her decision. One of the paradoxes of Kobach is that he has become a star in circles that focus on illegal immigration and voting fraud despite poor results in the courtroom. By ProPublica’s count, Kobach chalked up a 2–6 won-lost record in federal cases in which he was played a major role, and which reached a final disposition before the Kansas case. Those results occurred when Kobach was an attorney for the legal arm of the Federation for American Immigration Reform from 2004 to 2011, when he became secretary of state in Kansas. In his FAIR role (in which he continued to moonlight till about 2014), Kobach traveled to places like Fremont, Nebraska, Hazleton, Pennsylvania, Farmers Branch, Texas, and Valley Park, Missouri, to help local governments write laws that attempted to hamper illegal immigration, and then defend them in court. Kobach won in Nebraska, but lost in Texas and Pennsylvania, and only a watered down version of the law remains in Missouri. The best-known law that Kobach helped shape before joining the Kansas government in 2011 was Arizona’s “show me your papers” law. That statute allowed police to demand citizenship documents for any reason from anyone they thought might be in the country illegally. After it passed, the state paid Kobach $300 an hour to train law enforcement on how to legally arrest suspected illegal immigrants. The Supreme Court gutted key provisions of the law in 2012. Kobach also struggled in two forays into political campaigning. In 2004, he lost a race for Congress. He also drew criticism for his stint as an informal adviser to Mitt Romney’s 2012 presidential campaign. Kobach was the man responsible for Romney’s much-maligned proposal that illegal immigrants “self-deport,” one reason Romney attracted little support among Latinos. Romney disavowed Kobach even before the campaign was over, telling media outlets that he was a “supporter,” not an adviser. Trump’s election meant Kobach’s positions on immigration would be welcome in the White House. Kobach lobbied for, but didn’t receive, an appointment as Secretary of Homeland Security. He was, however, placed in charge of the voter fraud commission, a pet project of Trump’s. Facing a raft of lawsuits and bad publicity, the commission was disbanded little more than six months after it formally launched. Back at home, Kobach expanded his power as secretary of state. Boasting of his experience as a law professor and scholar, Kobach convinced the state legislature to give him the authority to prosecute election crimes himself, a power wielded by no other secretary of state. In that role, he has obtained nine guilty pleas against individuals for election-related misdemeanors. Only one of those who pleaded guilty, as it happens, was a non-citizen. Kobach fared no better in the second main area of the Kansas City trial than he had in the first. This part explored whether there is a less burdensome way of identifying non-citizens than forcing everyone to show proof of citizenship upon registration. Judge Robinson would conclude that there were many alternatives that were less intrusive. In his opening, Ho of the ACLU spotlighted a potentially less intrusive approach. Why not use the Department of Homeland Security’s Systematic Alien Verification for Entitlements System list, and compare the names on it to the Kansas voter rolls? That, Ho argued, could efficiently suss out illegal registrations. A month later, as chief of the voting fraud commission, Kobach took steps to compare state information to the SAVE database. He sent a letter to all 50 secretaries of state requesting their voter rolls. Bipartisan outrage ensued. Democrats feared he would use the rolls to encourage states to purge legitimately registered voters. Republicans labelled the request federal overreach. At trial, Kobach’s main expert on this point was Hans von Spakovsky, another member of the voter fraud commission. He, too, had been eager in commission meetings to match state voter rolls to the SAVE database. Von Spakovsky and Kobach have been friends for more than a decade. They worked together at the Department of Justice under George W. Bush. Kobach focused on immigration issues — helping create a database to register visitors to the U.S. from countries associated with terrorism — while von Spakovsky specialized in voting issues; he had opposed the renewal of the Voting Rights Act. Von Spakovsky’s history as a local elections administrator in Fairfax County, Va., qualified him as an expert on voting fraud. Between 2010 and 2012, while serving as vice chairman of the county’s three-member electoral board, he’d examined the voter rolls and found what he said were 300 registered non-citizens. He’d pressed for action against them, but none came. Von Spakovsky later joined the Heritage Foundation, where he remains today, generating research that underpins the arguments of those who claim mass voter fraud. Like Richman, von Spakovsky seemed nervous on the stand, albeit not combative. He wore wire-rimmed glasses and a severe, immovable expression. Immigration is a not-so-distant feature of his family history: His parents — Russian and German immigrants — met in a refugee camp in American-occupied Germany after World War II before moving to the U.S. Von Spakovsky had the task of testifying about what was intended to be a key piece of evidence for Kobach’s case: a spreadsheet of 38 non-citizens who had registered to vote, or attempted to register, in a 20-year period in Sedgwick County, Kansas. But the 38 non-citizens turned out to be something less than an electoral crime wave. For starters, some of the 38 had informed Sedgwick County that they were non-citizens. One woman had sent her registration postcard back to the county with an explanation that it was a “mistake” and that she was not a citizen. Another listed an alien registration number — which tellingly begins with an “A” — instead of a Social Security number on the voter registration form. The county registered her anyway. When von Spakovsky took the stand, he had to contend with questions that suggested he had cherry-picked his data. (The judge would find he had.) In his expert report, von Spakovsky had referenced a 2005 report by the Government Accountability Office that polled federal courts to see how many non-citizens had been excused from jury duty for being non-citizens — a sign of fraud, because jurors are selected from voter rolls. The GAO report mentioned eight courts. Only one said it had a meaningful number of jury candidates who claimed to be non-citizens: “between 1 and 3 percent” had been dismissed on these grounds. This was the only court von Spakovsky mentioned in his expert report. His report also cited a 2012 TV news segment from an NBC station in Fort Myers, Fla. Reporters claimed to have discovered more than 100 non-citizens on the local voter roll. “Now, you know, Mr. von Spakovsky, don’t you, that after this NBC report there was a follow-up by the same NBC station that determined that at least 35 of those 100 individuals had documentation to prove they were, in fact, United States citizens. Correct?” Ho asked. “I am aware of that now, yes,” von Spakovsky replied. That correction had been online since 2012 and Ho had asked von Spakovsky the same question almost two years before in a deposition before the trial. But von Spakovsky never corrected his expert report. Under Ho’s questioning, von Spakovsky also acknowledged a false assertion he made in 2011. In a nationally syndicated column for McClatchy, von Spakovsky claimed a tight race in Missouri had been decided by the illegal votes of 50 Somali nationals. A month before the column was published, a Missouri state judge ruled that no such thing had happened. On the stand, von Spakovsky claimed he had no knowledge of the ruling when he published the piece. He conceded that he never retracted the assertion. Kobach, who watched the exchange without objection, had repeatedly made the same claim — even after the judge ruled it was false. In 2011, Kobach wrote a series of columns using the example as proof of the need for voter ID, publishing them in outlets ranging from the Topeka Capital-Journal to the Wall Street Journal and the Washington Post. In 2012, he made the claim in an article published in the Syracuse Law Review. 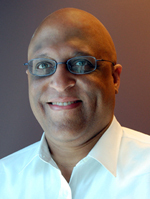 In 2013, he wrote an op-ed for the Kansas City Star with the same example: “The election was stolen when Rizzo received about 50 votes illegally cast by citizens of Somalia.” None of those articles have ever been corrected. Kobach’s case, and the broader claim, rely on an extremely generous definition. Legal definitions of fraud require a person to knowingly be deceptive. But both Kobach and von Spakovsky characterized illegal ballots as “fraud” regardless of the intention of the voter. Late in the trial, the ACLU presented Lorraine Minnite, a professor at Rutgers who has written extensively about voter fraud, as a rebuttal witness. Her book, “The Myth of Voter Fraud,” concluded that almost all instances of illegal votes can be chalked up to misunderstandings and administrative error. Kobach sent his co-counsel, Garrett Roe, to cross-examine her. “It’s your view that what matters is the voter’s knowledge that his or her action is unlawful?” Roe asked. “In a definition of fraud, yes,” said Minnite. Roe pressed her about this for several questions, seemingly surprised that she wouldn’t refer to all illegal voting as fraud. Kobach had explored a similar line of inquiry with von Spakovsky, asking him if the list of 38 non-citizens he’d reviewed could be absolved of “fraud” because they may have lacked intent. After Kobach concluded his questions, the judge began her own examination of von Spakovsky. “I think it’s fair to say there’s a pretty good distinction in terms of how the two of you define fraud,” the judge said, explaining that Minnite focused on intent, while she understood von Spakovsky’s definition to include any time someone who wasn’t supposed to vote did so, regardless of reason. “Would that be a fair characterization?” she asked. “Yes ma’am,” von Spakovsky replied. The judge asked whether a greater number of legitimate voters would be barred from casting ballots under the law than fraudulent votes prevented. In that scenario, she asked, “Would that not also be defrauding the electoral process?” Von Spakovsky danced around the answer, asserting that one would need to answer that question in the context of the registration requirements, which he deemed reasonable. The judge cut him off. “Well that doesn’t really answer my question,” she said, saying that she found it contradictory that he wanted to consider context when examining the burden of registration requirements, but not when examining the circumstances in which fraud was committed. The judge interrupted again. “So, the thousands of actual citizens that should be able to vote but who are not because of the system, because of this law, that’s not diluting the vote and that’s not impairing the integrity of the electoral process, I take it?” she said. Von Spakovsky didn’t engage with the hypothetical. He simply didn’t believe it was happening. “I don’t believe that this requirement prevents individuals who are eligible to register and vote from doing so.” Later, on the stand, he’d tell Ho he couldn’t think of a single law in the country that he felt negatively impacted anyone’s ability to register or vote. Money transfer scams, also called wire transfer scams, target both businesses and consumers. The affected firms include both small and large businesses. "At its heart, BEC relies on the oldest trick in the con artist’s handbook: deception. But the level of sophistication in this multifaceted global fraud is unprecedented... Carried out by transnational criminal organizations that employ lawyers, linguists, hackers, and social engineers, BEC can take a variety of forms. But in just about every case, the scammers target employees with access to company finances and trick them into making wire transfers to bank accounts thought to belong to trusted partners—except the money ends up in accounts controlled by the criminals." From January, 2015 to February 2017, there was a 1,300 percent increase in financial losses due to these scams, totaling $3 billion. To trick victims, criminals use a variety of online methods including spear-phishing, social engineering, identity theft, e-mail spoofing, and the use of malware. (If these terms are unfamiliar, then you probably don't know enough to protect yourself.) Malware, or computer viruses, are often embedded in documents attached to e-mail messages -- another reason not to open e-mail attachments from strangers. "Fraudsters target the CEO's and CFO's at various companies and hack their computers. They collect enough information to learn the types of billing the company pays, who the payee's are and the average balances paid. They then spoof a customer or, in other words, take their identity, and bill the company with wire transfer instructions to a scam bank account." Some criminals are particularly crafty, by pretending to be a valid customer, client or vendor; and use a slightly altered sender's e-mail address hoping the victim won't to notice. This technique is successful more often that you might think. Example: a valid sender's e-mail address might be johnson@XYZcompany.com, while the scammer uses johnson@XYZcompamy.com. Did you spot the alteration? If you didn't, then you've just wired money directly to the criminal's offshore account instead of to a valid customer, client, or vendor. Scammers can obtain executives' e-mail addresses and information from unprotected pages on social networking sites and/or data breaches. So, the data breaches at Under Armour, Equifax, Fresenius, Uber, the Chicago Board of Elections, Yahoo, Nationwide, Verizon, and others could have easily provided criminals with plenty of stolen personal data to do plenty of damage; impersonating coworkers, business associates, and/or coworkers. Much of the stolen information is resold by criminals to other criminals. Trading stolen data is what many cyber criminals do. "The best way to avoid being exploited is to verify the authenticity of requests to send money by walking into the CEO’s office or speaking to him or her directly on the phone. Don’t rely on e-mail alone." That means don't rely upon text messages either. 4. You got a check for too much money and you need to send back the extra"
"If the person claims (via e-mail) to need money for an emergency, call them first. Call another family member. Verify first if something truly happened. If the check received is too much money, call your bank before you deposit the check. Ask your bank what they think about wiring money back to someone. If the e-mail or phone caller says you received an inheritance or prize, "you do not have to pay for a prize. Ever. Did they say you have an inheritance? Talk to someone you trust. What does that person think?" If you have already sent money to a scammer, it's gone and you probably won't get it back. So, file a complaint with the FTC. Chances are the scammer will contact you again, since they (or their associates) were successful already. Don't give them any more money. "If someone calls and asks you for your personal information, money to activate the new card, or threatens to cancel your Medicare benefits if you don’t share your personal information, just hang up! It is a scam," said Attorney General Ellen Rosenblum. Medicare will not call you nor ask for your Social Security number or bank information. That's good advice for patients nationwide. Experts estimate that Medicare loses about $60 billion yearly to con artists via a variety of scams. Oregon residents suspecting healthcare fraud or wanting to report scammers, should contact Oregon's Department of Justice’s Consumer Protection (hotline: 1-877-877-9392 or www.oregonconsumer.gov). Consumers in other states should contact their state's attorney general, and/or report suspected fraud directly to Medicare. The video below from 2017 includes advice about how patients should protect their Medicare cards. "... and its co-founders and owners – Dr. Ebenezer Kolade and Dr. Christina Kolade – are enrolled as providers in the Connecticut Medical Assistance Program (CMAP), which includes the state's Medicaid program. As part of their practice, they provide methadone treatment services for patients dealing with opioid addiction. Most of their patients are CMAP beneficiaries. During the relevant time period, CMAP reimbursed methadone clinics by paying a weekly bundled rate that included all of the services associated with methadone maintenance, including the patient's doses of methadone; the initial intake evaluation; a physical examination; periodic drug testing; and individual, group and family drug counseling... The state and federal governments alleged that, from October 2009 to November 2013, New Era and the Kolades engaged in a pattern and practice of billing CMAP weekly for the methadone bundled service rate and then also submitting a separate claim to the CMAP for virtually every drug counseling session provided to clients by using a billing code for outpatient psychotherapy. The state and federal governments further alleged that those psychotherapy sessions were actually the drug counseling sessions already included and reimbursed through the bundled rate." These actions were part of the State of Connecticut's Inter-agency Fraud Task Force created in 2013 to investigate and prosecute healthcare fraud. The joint investigation included the Connecticut AT's office, the office of Connecticut U.S. Attorney John H. Durham, and the U.S. Health and Human Services, Office of Inspector General – Office of Investigations. Terms of the settlement agreement require NERC to pay $1,378,533 in settlement funds. Of that amount, $881,945 will be returned to CMAP. Connecticut residents suspecting healthcare fraud or abuse should contact the Attorney General’s Antitrust and Government Program Fraud Department (phone at 860-808-5040, or email at ag.fraud@ct.gov), or the Department of Social Services fraud (hotline at 1-800-842-2155, online at www.ct.gov/dss/reportingfraud, or email at providerfraud.dss@ct.gov). Residents in other states can contact their state's attorney general's office. We've all heard the old saying: seeing is believing. Right? Not necessarily anymore. "It starts with a selfie. Using that simple image, Hao Li, CEO of Los Angeles-based Pinscreen, can manipulate someone's face. You can literally put words in someone else's mouth. Li said it's all part of building a new virtual chat room world, but this type of advanced artificial intelligence technology is raising real eyebrows... For example, someone could take an image of President Trump and make him say something he didn't really say. Li said these kind of things are already possible in some ways. Comedian Jordan Peele used lip sync technology in a public service announcement (PSA) out Tuesday, warning against the dangers of fake news..."
"... at Pinscreen, Li said it won't take long before the line between what's real or not is erased. "It might be a year actually." "
Watch the entire CBS News report. These new image/video detection tools can't come soon enough. Consumers will need them. Journalists, military, intelligence, government watch-dog agencies, and corporate executives will need them, too. One can easily imagine bad actors using A.I. and other new technologies to create fake endorsements by celebrities of products, services, and/or politicians they really didn't endorse. What are your opinions? Last week, the U.S. Securities and Exchange Commission (SEC) charged a former Equifax executive with insider trading. While an employee, Jun Ying allegedly used confidential information to dump stock and avoid losses before Equifax announced its massive data breach in September, 2017. "... charged a former chief information officer of a U.S. business unit of Equifax with insider trading in advance of the company’s September 2017 announcement about a massive data breach that exposed the social security numbers and other personal information of about 148 million U.S. customers... The SEC’s complaint charges Ying with violating the antifraud provisions of the federal securities laws and seeks disgorgement of ill-gotten gains plus interest, penalties, and injunctive relief... According to the SEC’s complaint, Jun Ying, who was next in line to be the company’s global CIO, allegedly used confidential information entrusted to him by the company to conclude that Equifax had suffered a serious breach. The SEC alleges that before Equifax’s public disclosure of the data breach, Ying exercised all of his vested Equifax stock options and then sold the shares, reaping proceeds of nearly $1 million. According to the complaint, by selling before public disclosure of the data breach, Ying avoided more than $117,000 in losses... The U.S. Attorney’s Office for the Northern District of Georgia today announced parallel criminal charges against Ying." The massive data breach affected about 143 million persons. Equifax announced in March, 2018 that even more people were affected, than originally estimated in its September, 2017 announcement. "... found out about the breach on Friday afternoon, August 25, 2017... The SEC complaint says that Ying’s internet browsing history shows he learned that Experian’s stock price had dropped approximately 4% after the public announcement of [a prior 2015] Experian breach. Later Monday morning, Ying exercised all of his available stock options for 6,815 shares of Equifax stock that he immediately sold for over $950,000, and a gain of over $480,000... on Aug. 30, the global CIO for Equifax officially told Ying that it was Equifax that had been breached. One of the company’s attorneys, unaware that Ying had already traded on the information, told Ying that the news about the breach was confidential, should not be shared with anyone, and that Ying should not trade in Equifax securities. According the SEC complaint, Ying did not volunteer the fact that he had exercised and sold all of his vested Equifax options two days before. Equifax finally announced the breach on Sept. 7, and Equifax common stock closed at $123.23 the next day, a drop of $19.49 or nearly 14%..."
We've know for some time that a sizeable portion of voting machines in the United States are vulnerable to hacking and errors. Too many states, cities, and town use antiquated equipment or equipment without paper backups. The latter makes re-counts impossible. "... despite manifold warnings about election hacking for the past two years, the country has made remarkably little progress since the 2016 election in replacing antiquated, vulnerable voting machines — and has done even less to ensure that our country can recover from a successful cyberattack against those machines." "Russian effortsto influence the 2016 US presidential election represent the most recent expression of Moscow’s longstanding desire to undermine the US-led liberal democratic order, but these activities demonstrated a significant escalation in directness, level of activity, and scope of effort compared to previous operations. We assess Russian President Vladimir Putin ordered an influence campaign in 2016 aimed at the US presidential election. Russia’s goals were to undermine public faith in the US democratic process... Russian intelligence accessed elements of multiple state or local electoral boards. Since early 2014, Russian intelligence has researched US electoral processes and related technology and equipment. DHS assesses that the types of systems we observed Russian actors targeting or compromising are not involved in vote tallying... We assess Moscow will apply lessons learned from its Putin-ordered campaign aimed at the US presidential election to future influence efforts worldwide, including against US allies and their election processes... "
"This year, most states will use computerized voting machines that are at least 10 years old, and which election officials say must be replaced before 2020. While the lifespan of any electronic voting machine varies, systems over a decade old are far more likely to need to be replaced, for both security and reliability reasons... older machines are more likely to use outdated software like Windows 2000. Using obsolete software poses serious security risks: vendors may no longer write security patches for it; jurisdictions cannot replace critical hardware that is failing because it is incompatible with their new, more secure hardware... In 2016, jurisdictions in 44 states used voting machines that were at least a decade old. Election officials in 31 of those states said they needed to replace that equipment by 2020... This year, 41 states will be using systems that are at least a decade old, and officials in 33 say they must replace their machines by 2020. In most cases, elections officials do not yet have adequate funds to do so..."
"Since 2016, only one state has replaced its paperless electronic voting machines statewide. Security experts have long warned about the dangers of continuing to use paperless electronic voting machines. These machines do not produce a paper record that can be reviewed by the voter, and they do not allow election officials and the public to confirm electronic vote totals. Therefore, votes cast on them could be lost or changed without notice... In 2016, 14 states (Arkansas, Delaware, Georgia, Indiana, Kansas, Kentucky, Louisiana, Mississippi, New Jersey, Pennsylvania, South Carolina, Tennessee, Texas, and Virginia) used paperless electronic machines as the primary polling place equipment in at least some counties and towns. Five of these states used paperless machines statewide. By 2018 these numbers have barely changed: 13 states will still use paperless voting machines, and 5 will continue to use such systems statewide. Only Virginia decertified and replaced all of its paperless systems..."
"Only three states mandate post-election audits to provide a high-level of confidence in the accuracy of the final vote tally. Paper records of votes have limited value against a cyberattack if they are not used to check the accuracy of the software-generated total to confirm that the veracity of election results. In the last few years, statisticians, cybersecurity professionals, and election experts have made substantial advances in developing techniques to use post-election audits of voter verified paper records to identify a computer error or fraud that could change the outcome of a contest... Specifically, “risk limiting audits” — a process that employs statistical models to consistently provide a high level of confidence in the accuracy of the final vote tally – are now considered the “gold standard” of post-election audits by experts... Despite this fact, risk limiting audits are required in only three states: Colorado, New Mexico, and Rhode Island. While 13 state legislatures are currently considering new post-election audit bills, since the 2016 election, only one — Rhode Island — has enacted a new risk limiting audit requirement." "43 states are using machines that are no longer manufactured. The problem of maintaining secure and reliable voting machines is particularly challenging in the many jurisdictions that use machines models that are no longer produced. In 2015... the Brennan Center estimated that 43 states and the District of Columbia were using machines that are no longer manufactured. In 2018, that number has not changed. A primary challenge of using machines no longer manufactured is finding replacement parts and the technicians who can repair them. These difficulties make systems less reliable and secure... In a recent interview with the Brennan Center, Neal Kelley, registrar of voters for Orange County, California, explained that after years of cannibalizing old machines and hoarding spare parts, he is now forced to take systems out of service when they fail..."
That is embarrassing for a country that prides itself on having an effective democracy. According to BCJ, the solution would be for Congress to fund via grants the replacement of paperless and antiquated equipment; plus fund post-election audits. Rather than protect the integrity of our democracy, the government passed a massive tax cut which will increase federal deficits during the coming years while pursuing both a costly military parade and an unfunded border wall. Seems like questionable priorities to me. What do you think? Earlier this month,, the U.S. Federal Trade Commission (FTC) released its annual report of complaints submitted by consumers in the United States. The report is helpful is understand the most frequent types of scams and reports consumers experienced. 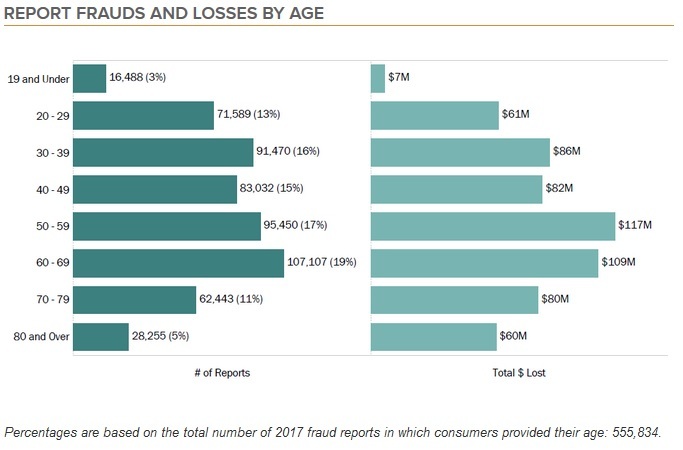 While the median loss for all fraud reports in 2017 was $429, consumers reported larger losses in certain types of scams: travel, vacations and timeshare plans ($1,710); mortgage foreclosure relief and debt management ($1,200); and business/job opportunities ($1,063). "The states with the highest per capita rates of fraud reports in 2017 were Florida, Georgia, Nevada, Delaware, and Michigan. For identity theft, the top states in 2017 were Michigan, Florida, California, Maryland, and Nevada." "Consumers in their twenties reported losing money to fraud more often than those over age 70. For example, among people aged 20-29 who reported fraud, 40 percent indicated they lost money. In comparison, just 18 percent of those 70 and older who reported fraud indicated they lost any money. However, when these older adults did report losing money to a scammer, the median amount lost was greater. The median reported loss for people age 80 and older was $1,092 compared to $400 for those aged 20-29." The second chart is key. 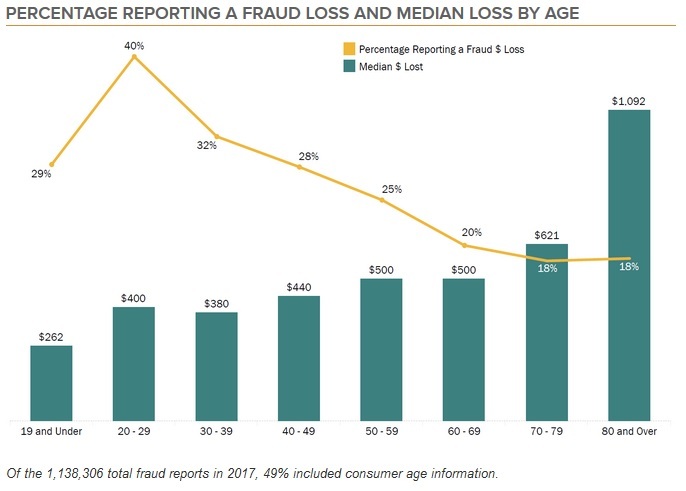 Twice as many younger consumers (40 percent, ages 20 - 29) reported fraud losses compared to 18 percent of consumers ages 70 and older. At the same time, those older consumers lost more money. So, older consumers were more skilled at spotting scams and few fell victim to scams. It seems both groups could learn from each other. CBS News interviewed a millennial who fell victim to a mystery-shopper scam, which seemed to be a slick version of the old check scam. It seems wise for all consumers, regardless of age, to maintain awareness about the types of scams. Pick a news source or blog you trust. Hopefully, this blog. Net Neutrality: Massachusetts Joins Multi-State Lawsuit Against FCC. What Next? "... joined New York Attorney General Eric T. Schneiderman in announcing that they will be filing a multi-state lawsuit against the Federal Communications Commission (FCC) over its vote to rollback net neutrality protections...The FCC recently issued a proposed final order rolling back net neutrality protections and on December 14th, voted 3-2 on party lines to implement the final order. On December 13th, AG Healey joined a coalition of 18 attorneys general in sending a letter to the FCC after reports emerged that nearly two million comments submitted in support of the agency were fake." "With the FCC vote, Americans will pay more for the internet and will have fewer options... The agency has completely failed to justify this decision and we will be suing to stand up for the free exchange of ideas and to keep the American people in control of internet access." "One of the most important roles that we perform is to prosecute fraud. It is a role we take extremely seriously, and one that is essential to a fair marketplace... The ‘Restore Internet Freedom’ proposal, also known as net neutrality rollback (WC Docket No. 17- 108) has far-reaching implications for the everyday life of Americans... Recent attempts by New York Attorney General Schneiderman to investigate supposed comments received by the FCC have revealed a pattern of facts that should raise alarm bells for every American about the integrity of the democratic process. A careful review of the publicly available information revealed a pattern of fake submissions using the names of real people. In fact, there may be over one million fake submissions from across the country. This is akin to identity theft on a massive scale – and theft of someone’s voice in a democracy is particularly concerning. As state Attorneys General, many of our offices have received complaints from consumers indicating their distress over their names being used in such a manner. While we will investigate these consumer complaints through our normal processes, we urge the Commission to take immediate action and to cooperate with law enforcement investigations. Woven throughout the Administrative Procedures Act is a duty for rulemakers to provide information to the public and to listen to the public. We know from advising our rulemakers at the state level that listening to the public provides insights from a diversity of viewpoints. But, if the well of public comment has been poisoned by falsified submissions, the Commission may be unable to rely on public comments that would help it reach a legitimate conclusion to the rulemaking process. Or, it must give less weight to the public comments submitted which also undermines the process..."
The FCC ignored the AGs' joint letter about fraud and proceeded with its net-neutrality vote on December 14. FCC Chairman Ajit Pai had blown off the identity theft and fraud charges as maneuvers by desperate net neutrality advocates. "... the FCC failed to do what is right... The FCC decided that consumers do not deserve free, open, and equal access to the internet. 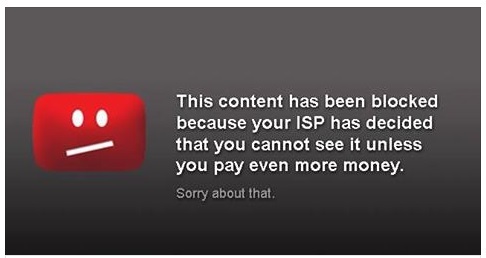 It decided to ignore the millions of Americans who voiced their strong support for our existing net neutrality rules. Here in California – a state that is home to countless start-ups and technology giants alike – we know that a handful of powerful companies should not dictate the sources for the information we seek..."
Residents in some states can use special sites to notify their state's AG about the misuse of their identity data in fake comments submitted to the FCC: Pennsylvania, New York. The FCC under Chairman Pai seems to listen and respond to the needs of corporate internet service providers (ISPs), and not to consumers. A November 21 - 25 poll found that 52 percent of registered voters support the current rules, including 55 percent of Democrats and 53 percent of Republicans. While that is down from prior polls, a majority support net neutrality rules. A poll by Mozilla and Ipsos in June, 2017 found overwhelming support across party lines: 76% of Americans, 81% of Democrats, and 73% of Republicans favor keeping net neutrality rules. The poll included approximately 1,000 American adults across the U.S. with 354 Democrats, 344 Republicans, and 224 Independents. "... About 81 percent of Americans oppose allowing Internet providers like Comcast and Verizon to charge Web sites and services more if they want to reach customers more quickly... Republicans were slightly more likely to support net neutrality than Democrats. 81 percent of Democrats and 85 percent of Republicans in the survey said they opposed fast lanes." "Most immediately, the activity will move to the courts... The most likely argument: that the commission’s decision violates federal laws barring agencies from crafting “arbitrary and capricious” regulations. After all, the FCC’s net neutrality rules were just passed in 2015... as capricious as the current FCC's about-face may seem, legal experts say the challenges won’t be a slam-dunk case. Federal agencies are allowed to change their minds about previous regulations, so long as they adequately explain their reasoning... The FCC's main argument for revoking the 2015 rules is that the regulations hurt investment in broadband infrastructure. But, as WIRED recently detailed, many broadband providers actually increased their investments, while those that cut back on spending told shareholders that the net neutrality rules didn't affect their plans. University of Pennsylvania Law School professor Christopher Yoo says courts generally defer to an agency's expertise in interpreting evidence submitted into the record... net neutrality advocates could also argue that the agency's decision-making process was corrupted by the flood of fake comments left by bots. But FCC Chair AJit Pai will argue that the agency discarded low-quality and repeated comments and focused only on matters of substance... A long-term solution to net neutrality will require Congress to pass laws that won't change every time control of the White House passes to another party... Senator John Thune (R-South Dakota) recently called for Congress to pass bipartisan net neutrality legislation. In 2015, Thune and Representative Fred Upton (R-Michigan) introduced a bill that would have banned blocking or slowing legal content, but limited the FCC's authority over internet service providers. It never moved forward. Thune is clearly hoping that growing demand from the public for net neutrality protections will bring more Republicans to the table... Senator Ron Wyden (D-Oregon) told WIRED earlier this year that he won't support a bill with weaker protections than the 2015 rules..."
President Trump appointed Pai as FCC Chairman in January, giving the Republican commissioners at the FCC a voting majority. Neither the President nor the White House staff said anything in its daily e-mail blast or in their website about the FCC vote; and instead discussed tax reform, general remarks about reducing regulation, and infrastructure (e.g., roads, bridges, tunnels). Seems to me the internet is a key component of our country's infrastructure. What are your opinions? If your state isn't in the above list, we'd like to hear from you, too. Later today, the commissioners at the U.S. Federal Communications Commission (FCC) will likely vote during their December 2017 Open Commission Meeting to kill net neutrality rules protecting consumers free and open internet access. The planned vote comes despite clear and mounting evidence of widespread identity theft by unknown persons to submit fake comments distorting and polluting FCC record and website soliciting feedback from the public. “This is crazy. Two million people have had their identities stolen in an effort to corrupt our public record. Nineteen State Attorneys General from across the country have asked us to delay this vote so they can investigate. And yet, in less than 24 hours we are scheduled to vote on wiping out our net neutrality protections. We should not vote on any item that is based on this corrupt record. I call on my colleagues to delay this vote so we can get to the bottom of this mess.” "
Despite the widespread identity theft and fraud, FCC Chairman Ajit Pai has maintained his position to proceed with a vote today to kill net neutrality protections for consumers. President Trump appointed Pai as FCC Chairman in January, giving the Republican commissioners a majority when voting. Pai has blown off the identity theft and fraud charges as maneuvers by desperate net neutrality advocates. Was Your Identity Information Misused To Submit Fake Comments To The FCC About Net Neutrality? "In the last five days alone, over 3,200 people have reported misused identities to the Attorney General’s office, including nearly 350 New Yorkers from across the state. Attorney General Schneiderman urges New Yorkers to continue to check whether their identity was misused and report it to his office in order to inform the investigation." The webpage automatically links to only net neutrality (Docket 17-108) comments with the U.S. Federal Communications Commission (FCC) site. So, at least 3,200 persons have confirmed the misuse of their identity information by unknown persons (or bots) to pollute feedback by the public about net neutrality rules protecting consumers' broadband freedoms. You'd think that FCC Chairman Ajit Pai would be concerned about the pollution and fraud; and would delay the upcoming December 14th vote regarding net neutrality. But he's not and blew off the fake comments allegations, as explained in this earlier blog post. You might think that Chairman Pai and the FCC would be concerned about pollution and fraud in feedback submitted to the FCC site, given the massive Equifax data breach in September which exposed the data elements (e.g., name, street addresses) criminals and fraudsters could easily use to submit fake comments. This makes one wonder if the FCC can be trusted under Chairman Pai's leadership. Hopefully, Attorneys General in other states will provide similar webpages to help residents in their states... and not only for comments about net neutrality. "The Office of the New York State Attorney General is investigating whether public comments regarding net neutrality rules wrongfully used New Yorkers’ identities without their consent. We encourage you to search the FCC’s public comment website and tell us if you see any comments that misuse your name and address. First, search below to find any comments that may have misused your identity. If results appear, click on any comment that uses your name, and when the comment appears review the name, the address, and the comment text. (If no results appear, your identity most likely was not misused.)" You don't need to be a New York State resident to use this online tool. My initial search produced 1,046, so I narrowed it by entering my name in quotations ("George Jenkins") for a more precise match. That second search produced 40 comments about net neutrality (e.g., Docket 17-108), a manageable number. I browsed the list which included my valid comment submitted during May, 2017. I did not see any other comments using my name and address. That's good because I only submitted one comment. I noticed comments by persons with the same name in other states. That seems okay. It's reasonable to expect multiple persons with the same name in a country with a population of about 360 million people. I did not check the addresses of the other persons with the same name. I realize that could easily hide synthetic ID-theft. In traditional synthetic ID-theft, criminals mix stolen (valid) Social Security numbers with other persons' names to avoid detection. In the ECFS comments system, one could enter valid names with fake addresses; or vice-versa. I hope that AG Schneiderman's fraud analysis also checks for both types of synthetic ID-theft: 1) fake names at real addresses, and 2) real names at fake addresses. If I had found fraudulent entries, I would have notified AG Schneiderman, the Attorney General's office in the state where I live, and the FCC. Did you check for misuse of your identity information? What did you find? "You’re at work and want to check Facebook on your lunch break to see how your sister is doing. This is not exactly a straightforward task, as your company uses Verizon. You’re not about to ask your boss if they’d consider putting up the extra cash every month so that you can access social media in the office, so you’ll have to wait until you get home. That evening, you log in to pay your monthly internet bill — or rather, bills. See, there’s the baseline internet cost, but without net neutrality, you also have to pay a separate monthly fee for social media, another for "leisure" pages like Reddit and Imgur, and another still for liberal-leaning news sites — because your provider’s CEO is politically conservative. Not only is your bill confusing, you’re not sure you can really afford to access all these websites that, at one point in time, you took for granted. In addition to the sites you can access if you pay for them, there are also websites that have just become lost to you. Websites that you once frequented, but that now, you aren’t even sure how to access anymore. You can’t even pay to access them. You used to like reading strange Wikipedia articles late at night and cruising for odd documentaries — but now, all those interests that once entertained and educated you in your precious and minimal free time are either behind yet another separately provided paywall or blocked entirely. You’ve started to ask around, see if your friends or coworkers with other providers have better access... but the story is pretty much always the same." Both middle-class and poor online users will bear the brunt of the price increases. "Some countries are already living this reality. In New Zealand, Vodafone offers mobile internet packages that are comprised of different types of services. You might have to pay a certain amount to access social apps like Snapchat and Instagram, and a separate fee to chat with friends via Facebook Messenger and iMessage. A similar framework is used by Portugal’s MEO, where messaging, social media, music streaming, video streaming, and email are also split into separate packages. "Federal Communications Commission (FCC) Chairman Ajit Pai told Breitbart News in an exclusive interview that an open and free internet is vital for America in the 21st century. During a speech at the Newseum on Wednesday, Pai said he plans to roll back the net-neutrality regulations and to restore the light-touch regulatory system established by President Bill Clinton and Congressional Republicans by the 1996 Telecommunications Act... Chairman Pai said during his speech that the internet prospered before net neutrality was enacted... Breitbart News asked the FCC chief why he thinks that net neutrality is a problem, and why we must eliminate the rule. He said: "Number one there was no problem to solve, the internet wasn’t broken in 2015. In that situation, it doesn’t seem me that preemptive market-wide regulation is necessary. Number two, even if there was a problem, this wasn’t the right solution to adopt. These Title II regulations were inspired during the Great Depression to regulate Ma Bell which was a telephone monopoly. And the broadband market we have is very different from the telephone market of 1934. So, it seems to me that if you have 4,462 internet service providers and if a few of them are behaving in a way that is anti-competitive or otherwise bad for consumer welfare then you take targeted action to deal with that. You don’t declare the entire market anti-competitive and treat everyone as if they are a monopolist. Going forward we are going to propose eliminating that Title II classification and figure out the right way forward. The bottom line is, everyone agrees on the principles of a free and open internet what we disagree with is how many regulations are needed to preserve the internet." "
"Net neutrality passed under former Democrat Tom Wheeler’s FCC in 2010." "More than 1,000 startups and investors have now signed an open letter to Pai opposing the proposal. The Internet Association, a trade group representing bigger companies like Facebook, Google, and Amazon, has also condemned the plan. "The current FCC rules are working for consumers and the protections need to be kept in tact," Michael Beckerman, president and CEO of the Internet Association, said at a press conference Wednesday." Regular readers of this blog are aware that more than "a few" ISPs committed abused consumers and content producers. (A prior blog post listed many historical problems and abuses of consumers by some ISPs.) Also, consider this: Pai made his net-neutrality position clear long before the public submitted comments to the FCC this past summer. Sounds like he never really intended to listen to comments from the public. Not very open minded. As bad it all of this sounds, it's even worse. How? An FCC Commissioner, 28 U.S. senators, and the New York State Attorney General (AG) have lobbied FCC Chairman Pai to delay the net neutrality vote planned by the FCC on December 14, due to clear and convincing evidence of the massive fraud of comments submitted to the FCC's online commenting system. In short, the FCC's online comments system is corrupted, hacked, and unreliable. The group (e.g., FCC commissioner, 28 Senators, and NY State AG) also objects to the elimination of net neutrality on the merits. "FCC Chairman Ajit Pai says that net neutrality rules aren't needed because the Federal Trade Commission can protect consumers from broadband providers... When contacted by Ars, Pai's office issued this statement in response to the [delay request] letter: "This is just evidence that supporters of heavy-handed Internet regulations are becoming more desperate by the day as their effort to defeat Chairman Pai's plan to restore Internet freedom has stalled. The vote will proceed as scheduled on December 14." I find the whole process deeply disturbing. First, only 28 U.S. Senators seem concerned about the massive comments fraud. Why aren't all 100 concerned? Second, why aren't any House members concerned? Third, President Trump hasn't said anything about it. (This makes one wonder if POTUS45 either doesn't care consumers are hurt, or is asleep at the wheel.) Elected officials in positions of responsibility seem willing to ignore valid concerns. Many consumers are concerned, and protests to keep net neutrality are scheduled for later today outside Verizon stores nationwide. What do you think?